Atlanta's M.L. King Tournament a rousing success! 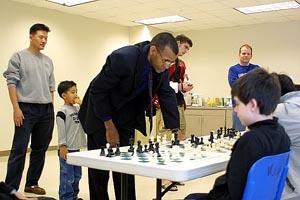 Kay Umeakunne serves as 2nd Vice President of the Georgia Chess Association. Prior to accepting this post she had been active for several years promoting scholastic chess in the Atlanta area. Of course, the success of her efforts in children's tournament is helped by the fact that she bakes the most delicious chess cakes. 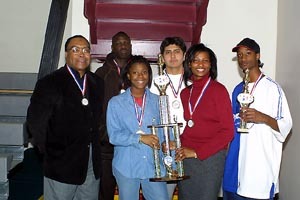 Three years ago, the idea of running a tournament in the memory of Dr. Martin Luther King, Jr. was hatched. Dr. King is known to the world as an ardent leader in fighting for civil rights for Black people in the 50s and 60s. He was born on January 15th and his birthday become a national holiday. 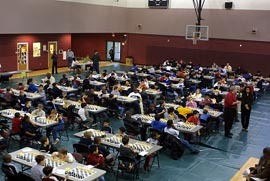 On January 18th, the weekend commemorating the holiday, 168 children (from kindergarten to 12th grade) assembled at The Martin Luther King Recreation and Community Center to do battle. Mrs. Umeakunne, the Chief Organizer this year, revamped the tournament and brought it to the center for the first time. 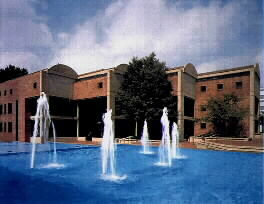 The recreation center is part of the M.L. King Historic District which includes Dr. King's childhood home and the world-famous MLK Center. 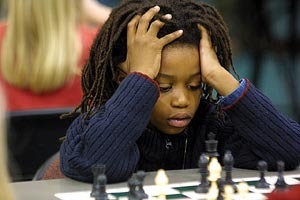 While the aim of chess is certainly not non-violent, the manner in which these children conducted themselves was exemplary. IM-elect Stephen Muhammad was invited and conducted a couple of simultaneous exhibitions. There was also a performance given by a step team from Heritage high school (Conyers, Georgia). These step routines (which have African roots) were popularized by Black college fraternities and sororities and feature an incredible combination of synchronized steps, hand claps, gymnastics and dance choreography… and of course, there was cake! 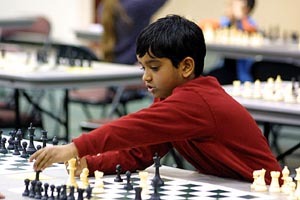 "It was a good tournament and the first MLK tournament we've been to. It had a little something for everyone in it. I was pleased with the competition. Dakota had a lot of fun; he socialized a lot and got to play football with the older kids. The venue and hall were good and the Heritage High School girls were great. 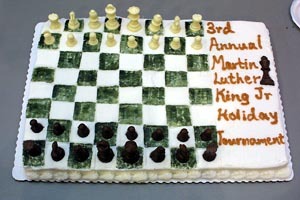 The kids loved the chess cake. It added a nice touch." Mrs. Umeakunne is to be commended for her tireless efforts. Her account of the event will be featured in the next Georgia Chess magazine. There were more than 200 pictures taken by Frank Johnson, some of which can viewed below… he holds all rights and privileges. Congratulations on a fine effort by all who made it possible! Is this young lad giving mate? 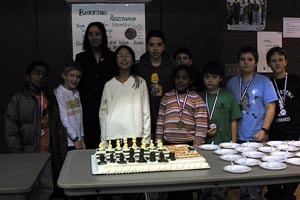 Mrs. Umeakunne (rear left) with some very happy chess players.